Not sure it would make sense for alligators to be out that far, unless they got there by accident or there was just a few really, really dedicated individuals that managed to swim there. I wouldn't. I'd actually love to see more villain revivals; Titanus, Dragonlord, Chien Kahn, Silver, Magligna and the hive, etc. Dig into the toybox more, before buying more new toys! He's an American Alligator. A wrongly colored American Alligator (they're usually black), but everything about his build says that's what he is. The shape of his head and snout, his bulk. A crocodile would be more slender in every way. 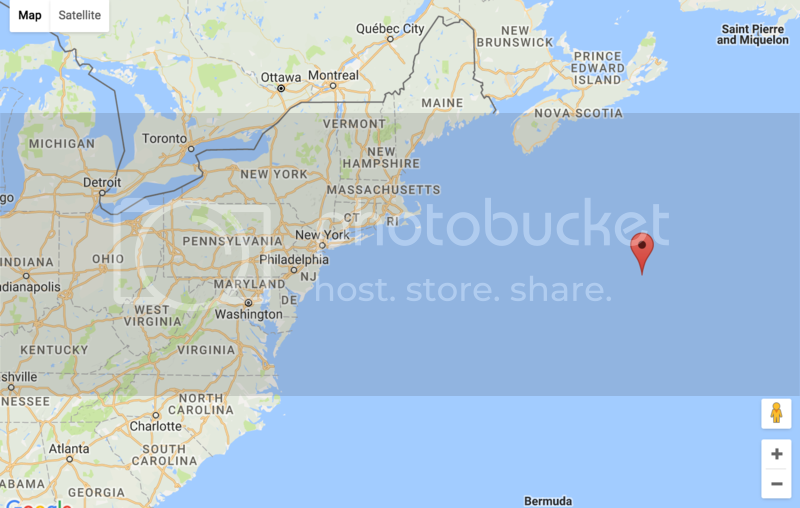 The Titanic wreckage is in the Labradore Sea, 370 miles south from Newfoundland. It was nowhere close to Britain at that point, especially because it was so close to the end of journey. It's right about at 41.726931° N -49.948253° W .
So, the Titanic wreckage would be about 588.74 miles from Burnow. Probably too far for them to know what was going until after the event. In fact, Burnow is quite a lot closer to New York than the Titanic was when it sank. Considering how Alopex was a cute little bad@$$ fox with a "Tragic Backstory™ right from the get-go, it seems like she was always meant to switch sides. Not to mention that because she's a cute little fox, she is extremely identifiable, especially considering the glut of fox characters that exist on the internet, including those similar to her. Which is honestly why I don't care much for her. I'm not so sure she was ever truly a cold-cut villain in the same way as Hob, Shredder and Krang - who certainly does have something of a Tragic Backstory. And of course, she was never a villain who acted on her own. She was a crony, and I'm not so sure she could be an antagonist on her own. I'd say the way her personal needs were written during that time were far different from Hob and Krang - who are both commandeering and having suffered losses that they would understand with Alopex. The difference is that when it comes from separation from family and home, she is more on Raphael's field of empathy than Hob and Krang. Hob who was actually a complete and total innocent when he was thrown out by his "family" (making his backstory the only mini I can't stand to read on an emotional level), and Krang, who could have had the power to stop what was happening on his homeworld but couldn't - and I've assumed that he has suffered mentally from separation of his own kind. Imagine you're the last human, save for the ones you've managed to save who are in stasis; your own father could be called directly responsible for the destruction and was so bull-headed you couldn't convince him to stop for the sake of your home and people. You have to spend decades upon decades with another species who are basically ants to you and have far shorter lifespans. Which means that even if you did decide to make a friendship out of a total alien, it would be short lived. Besides, it wouldn't be the same. You'd be spending most of that time cooped up in a tiny box behind glass because you can't breathe the air in the potential new home. Which forces you to eat and sleep completely alone in specialized areas that the aliens can't come in because they can't breathe that air. And to rub salt in the wound, the ones who are your friends are basically in induced comas and kept alive in stasis. If any of them were lovers, that level of intimacy was denied. What little spare time you have is spent alone in their stasis room, the closest you can get for proper socialization. And with no one around that you see fit to talk you out of it, there's nothing to stop you from pulling the same level of destruction that your father pulled with the hopes that it would lead to saving your people. Alopex was straight-up abducted and experimented on. Granted, Hob was as well, but he had at least been mutated beforehand and made his presence known to the humans. They'd probably get along marginally, but don't become friends. Because Alopex wouldn't agree with Hob's mentalities, and Alopex is basically a wild dog to Hob. When it comes to recovery, Alopex and Hob were able to make friends and want to maintain relationships. 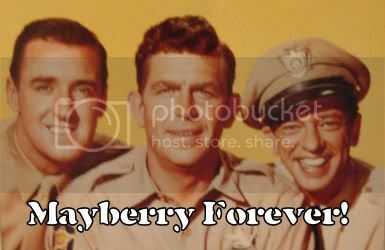 Even if they had to literally make some of those friends like Hob did. Krang did not have that opportunity and knows better than to take any of those. He is not out to create new friendships, but to preserve and give a new life to those who are his friends, even if he has to suffer mentally. Friendships with humans and human-like beings would not last long enough for him; he had no equal. 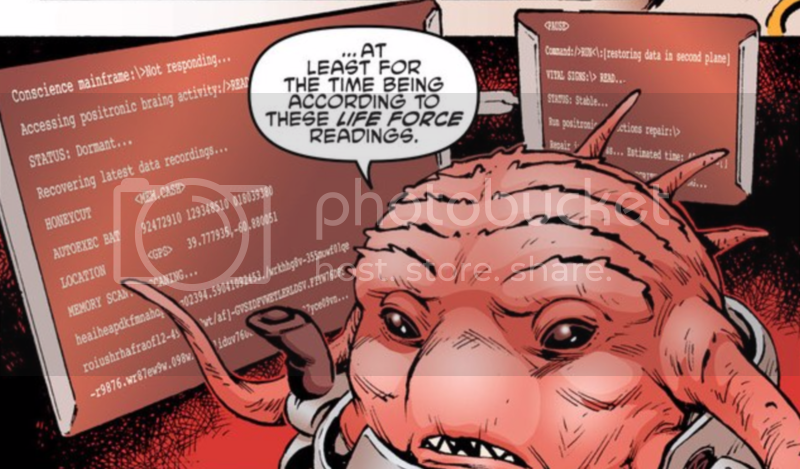 If circumstances were completely different, he could have had Honeycutt as an advisor at the very least, but that would never have happened in the set IDW universe as it is. But at the very least, Honeycutt might understand his situation more than others. As for more villains...Ch'rell is coming and so are the Triceratons. Bobby Curnow has said the Triceratons would be some time in 2017. Ch'rell, who was probably very close to Krang given how Honeycutt and Ma'riell have described him so far. 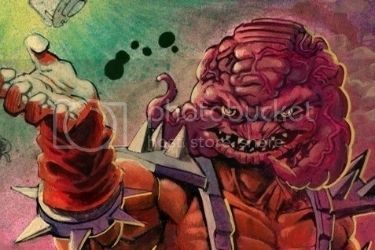 Krang's greatest warrior and so zealously devoted to him that his sister was more concerned about Ch'rells reaction to Krang's imprisonment than their combined war crimes? I'd say that's...very, very close. Last edited by Utrommaniac; 10-30-2016 at 12:12 PM. So I'm not sure about the weather, but even if by some strange circumstance there's an alligator that far out, wouldn't it be too cold for them to survive? I was wondering about that myself. To put it in perspective with the Titanic sinking...it was so f***ing cold in the Labradore Sea on the night that the Titanic sank, with the night sky so clear of disruption and without a moon, that it literally made a mirage that caused icebergs to be obstructed from view. You simply could not see ice bergs, it was that cold. But yeah, it would be extremely cold out there for a reptile, especially in the spring and winter. So there's no way for them to be there naturally. However, on Burnow, none of the predators that would attack alligator nests would be there. It could be possible that before Krang came to Burnow, a European expedition ship came there with a bunch of alligators and other animals, and those managed to escape and breed. Because of scarcity of food and the cold, not all of them would thrive, but Leatherhead would have been one of the lucky survivors. He could have hibernated during the colder parts of the year. In some way, there was a silver lining to his mutation that could have made it easier for him to live, but it would be marginal. 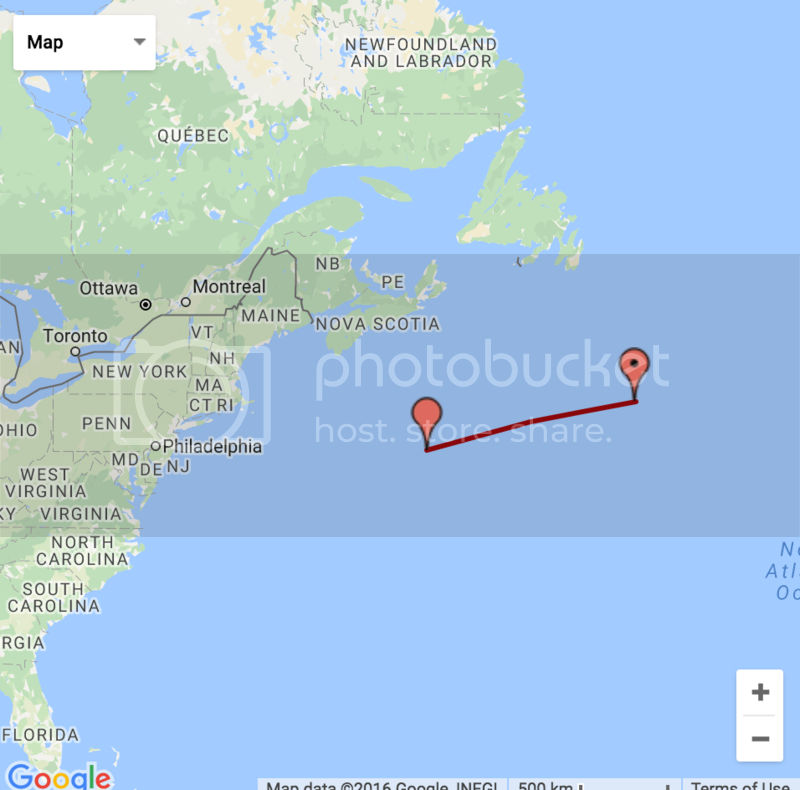 I just checked and Burnow is too far north from the Bermuda Triangle. It goes from Bermuda, to Miami, to Costa Rica. As for the storm that came over Burnow, it was probably Tropical Storm Andrea. Last edited by Utrommaniac; 10-30-2016 at 12:44 PM. Hm... Maybe the simplest explaination for why he's that far out and incorrectly colored, is that he wasn't really an American Alligator? He is older than modern biology after all, so he could easily be some undiscovered/extinct species/sub-species that evolved for salt water and colder weather? Maybe. A lighter color adaptation would help him in a colder environment, as dark colors can often be a death sentence in those climates. Lol thanks for correcting my ignorance with he Titanic. Also I know Leather Head is a alligator, but I threw out the idea of salt water crock, bc he lived in salt water in this universe. My favorite scene for Alopex is just Before/Beginning City Fall when Alopex is training to fight the turtles. She looked badass and scary. Is Agent Bishop after mutants to create super soldiers for an army to protect Earth from aliens or something different this time? I am also curious if Earth Protection Force and Dark Water are selarate branches of the executive branch like the CIA and DBI who have to work together at times. Considering Blackwater's role in the OT, they might take on the 'good cop' role for government, with Bishop and the EPF taking the 'bad cop' role. 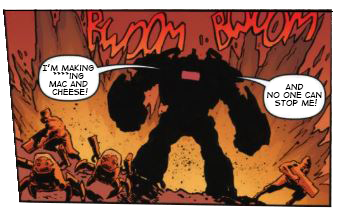 I think the EPF is focused on mutants this time, with bishop not being obsessed with aliens in IDW, but rather mutants. This would give him a more personal hate for the TMNT. I would think that in the case of the Universe set, the mutants were the first ones he could deal with at the time - and he probably assumed they'd be easier than the aliens he was watching. If he has a problem with both, then it's likely he's just trying to get them where he can take them. He's also likely figured out that the aliens are responsible for the mutants in one way or another. - Hob himself has gotten the Mutanimals under his control and is preparing for a turf war. - Karai, Bludgeon and Koya all went to Japan. We haven't seen them in a while though. - Traag and Granitor were on Burnow Island and defeated by the Turtles, they're locked up somewhere there. - Rat King, Kitsune, etc. are all still scheming behind the scenes. I really like how even with Shredder and Krang gone for now, all the original villains from the first 50 issues are still being given things to do and a follow up without the two "main villains." I'm not sure about Tragg and Granitor being "locked up", especially with how beaten up they were by Leatherhead. My guess is they were just dumped in a room somewhere for the Utroms to find...which may have not been the best thing for them. They probably did finally get their air at some point. I firmly predict that when we next return to Burnow Island, Tragg and Granitor have been accepted by the Utroms due to their previous allegiance to Krang and are now serving as security.